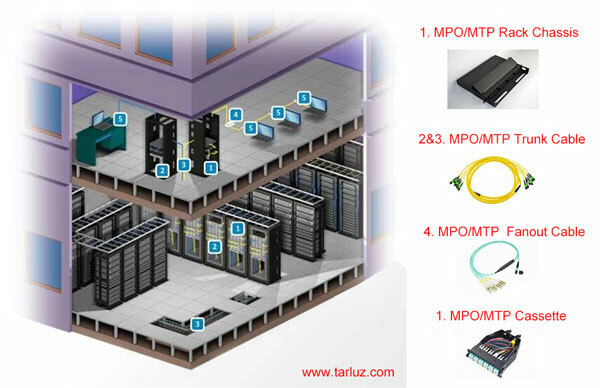 The deployment of a PON architecture requires a number of outside plant components,　including the optical distribution frame, splitters, splicing closures, and wall-mounted　boxes on the home or the building. It also requires fibre-optic cables with specific　performance characteristics, both in the indoor and outdoor environment. The selection of cables and associated components, as well as how they are　implemented in the network – including the splitting ratio – are key to optimizing　capex and to reducing opex. 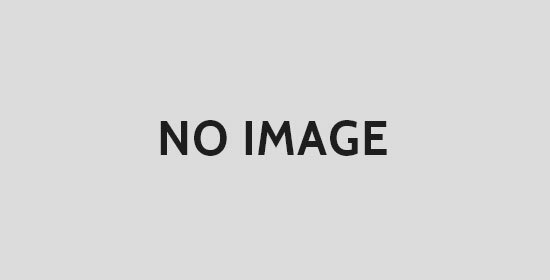 The network owner will require comprehensive　expertise in these areas if PON investment is to be maximized. A key component of the PON architecture is the optical distribution frame (ODF), which　houses the OLTs and is located in the central office. It has to be capable of a number of　functions, including the connection to ports in different sections of the central office. 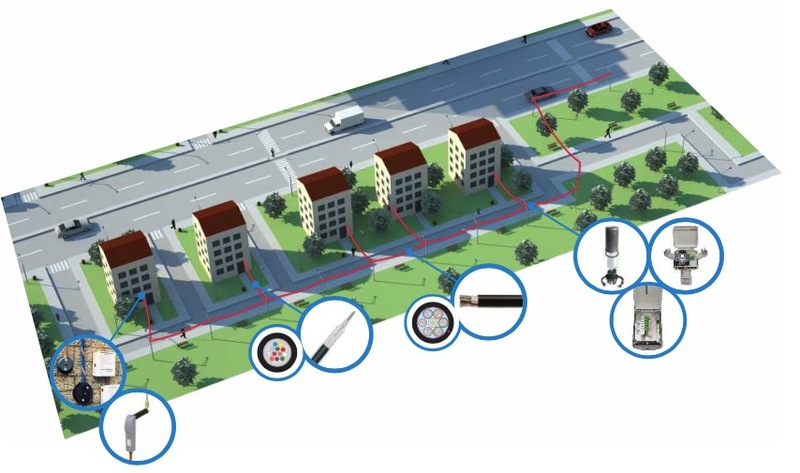 Patching port connections enables operators to use their existing billing and　management systems for PON customers, and requires fibre splicing and fibre coiling. The placing of 1xn splitter – where ‘1’ represents one incoming strand of fibre and　‘n’ the number of splits (in PON configurations, ‘n’ can represent 2, 4, 8, 16, 32 and　64) – is not normally located in the central office as this can increase capex on　outside fibre plant. However, the operator may consider installing a 2xn splitter at　the central office (where two incoming fibres are accommodated). The 2xn splitter　can be used as a means by which operators can introduce a test function on the　PON, which can be managed from the central office. Accessible splicing closures, with a mechanical sealing system, is another key part of　a flexible and scaleable PON architecture. The primary function of a splicing closure　is to interconnect transport cables onto multiple distribution cables and, in turn, to　enable multiple drop cables from the distribution cables themselves. To guarantee　these functions while minimising capex, the closure has to be re-accessible and resealable for progressive PON　deployment. Part of this flexibility requires the　splicing closure to have a scalable splicing tray capability. This, in turn, provides　scalability on the splitter ratio. To maximise the component functions as outlined in 2.3.2, the selected cables need　to have complementary features, such as small diameters and mid-span access　capability. Mid-span access is where the cable can be stripped in the middle of a　length in order to get access only to the selected fibres for splicing. For multi-dwelling units where there is high subscriber density, operators have two　choices of fibre-optic cable to go through the vertical riser: Low Smoke Zero　Halogen (LSZH) cables with ‘standard pull installation’ or micro-blown cable with　an associated Halogen Free Flame Retardant micro duct (see section 4.3.1 on　‘blowing’ fibre through micro ducts). For low-density buildings, a drop cable for a single user can be installed directly　from the basement. But in both cases (high-density and low-density subscriber　buildings) the drop cables from the basement (or from the floor) to the subscriber　flat – as well as the indoor fibre-optic cables that connect onto the ONT – bendinsensitive fibre has to be used. According to Nexans, the use of bend-insensitive　fibre introduces an extra initial cost of ‘a few percent’ but reduces opex. For the drop cable connection, an external transition box can be located against　the wall of the subscriber. If no external transition box is used, the design of the　drop cable must include double sheath to operate the transition between external　environment conditions to internal LSZH requirements. Once the fibre-optic drop cable penetrates the home, it is connected onto a wall　outlet box fitted with a connector adapter to connect the patch cord onto the ONT. All the cables, at this level of the network, have to include bend-insensitive fibre to　maximize opex savings.